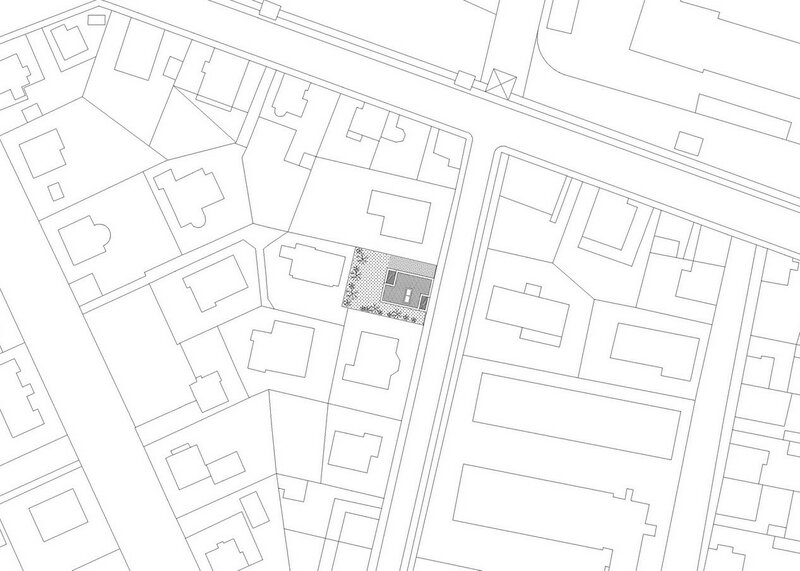 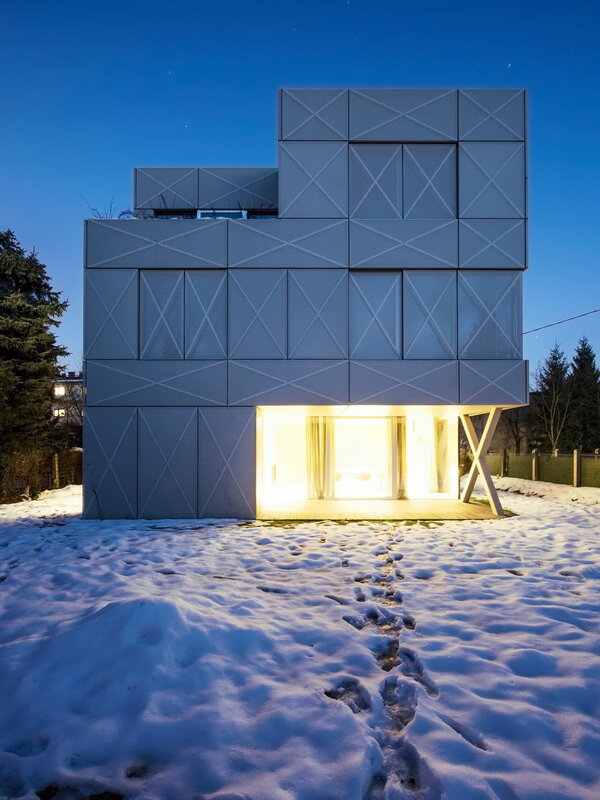 The Villa is located in the Mirje Suburbs within the city center of Ljubljana, Slovenia. 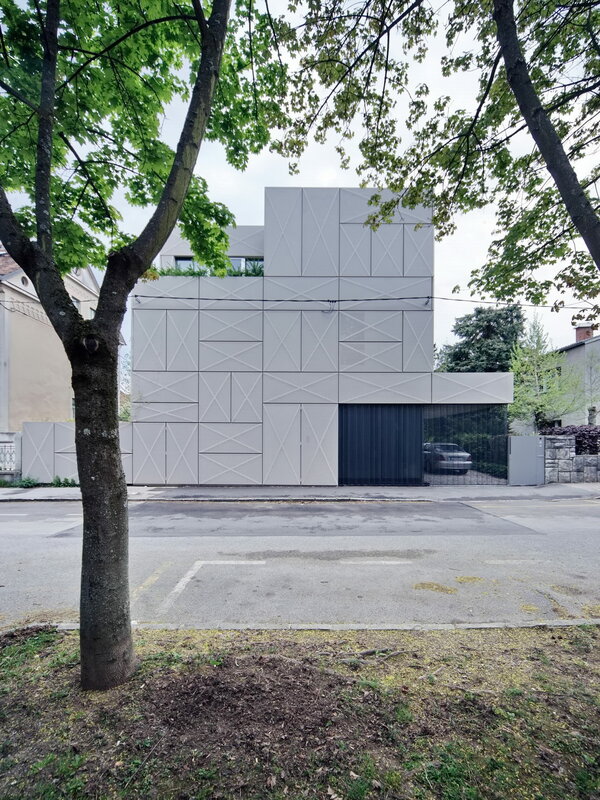 The street of the villa runs perpendicular to the ancient Roman Wall and continues into a pedestrian passageway under the stone pyramid designed by Plecnik (as part his reconstruction project along the wall). 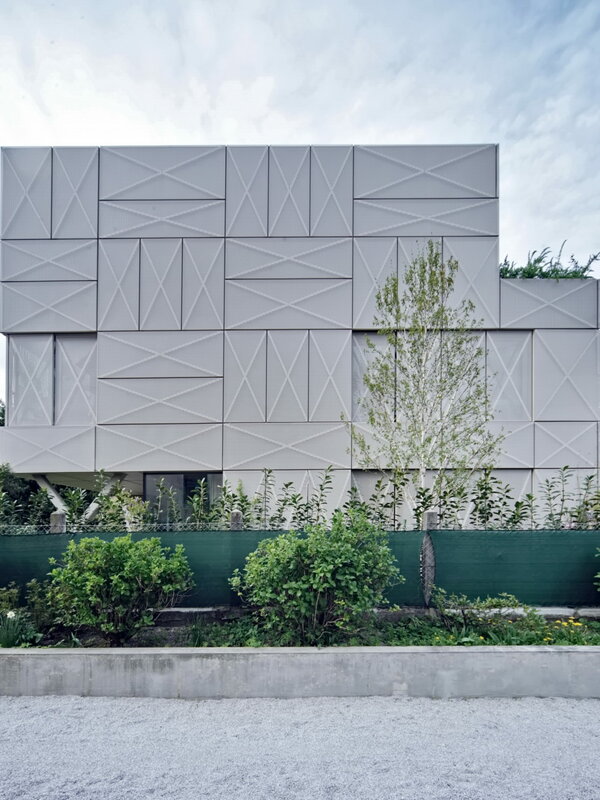 The Villa’s new structure embeds an existing retaining wall along the street front. 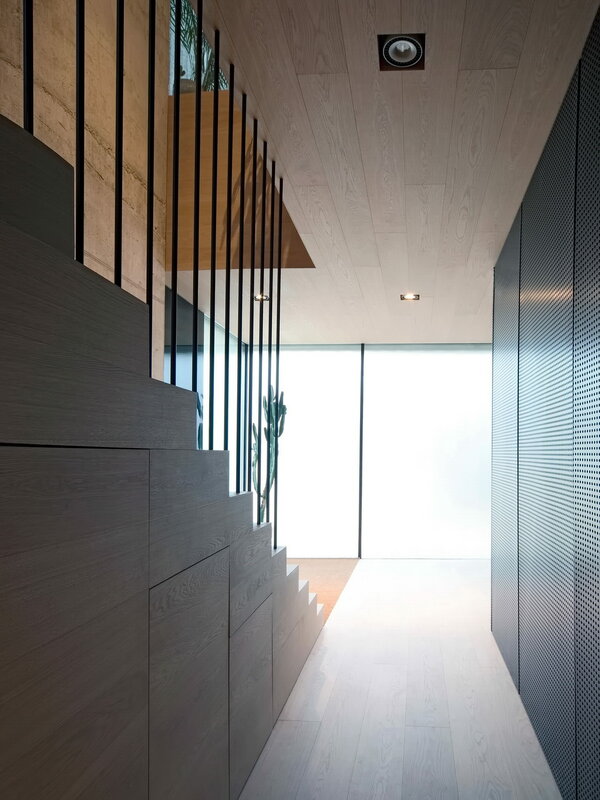 By incorporating the wall as part of the new construction, the new house keeps original position on this street in an axial alignment to the pyramid. 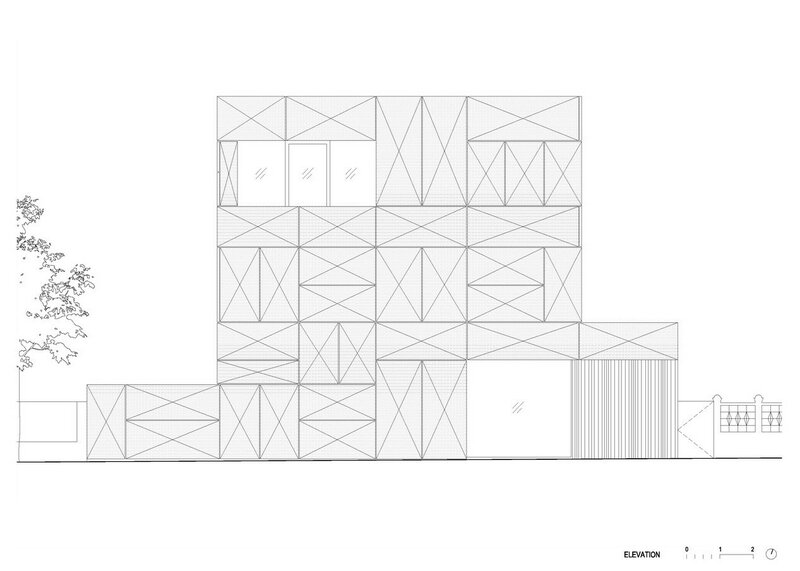 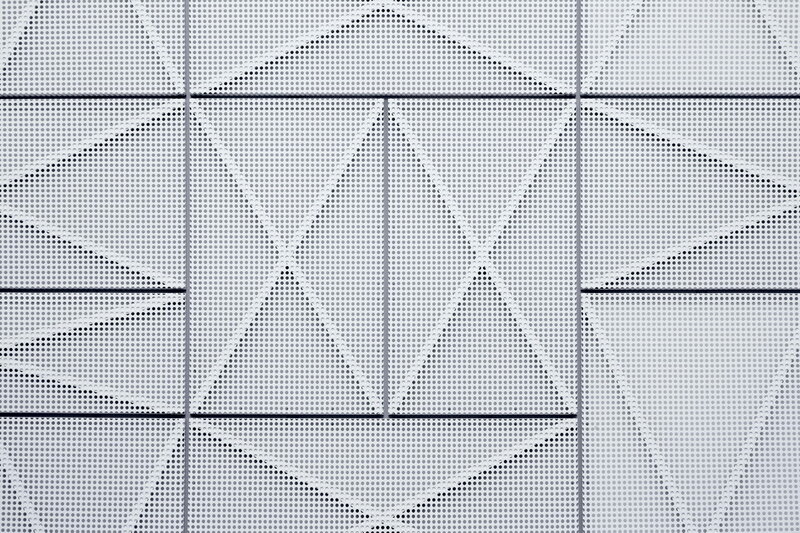 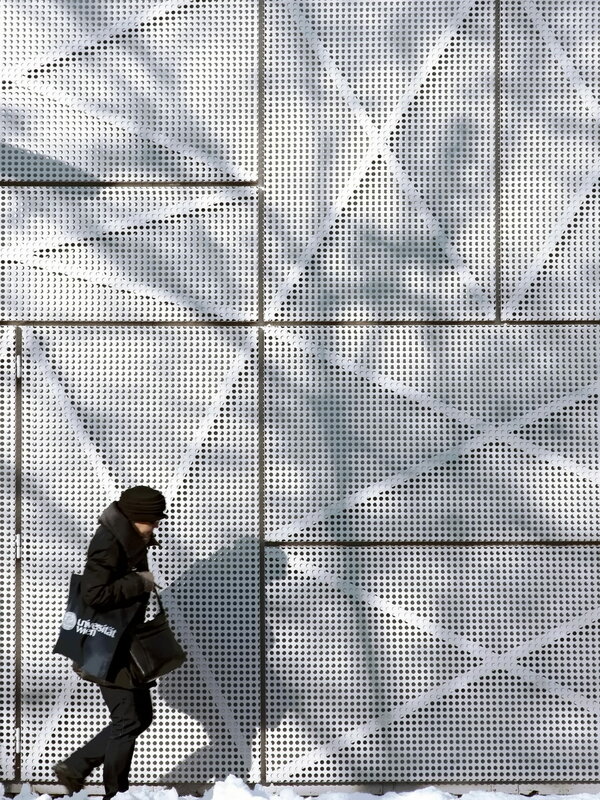 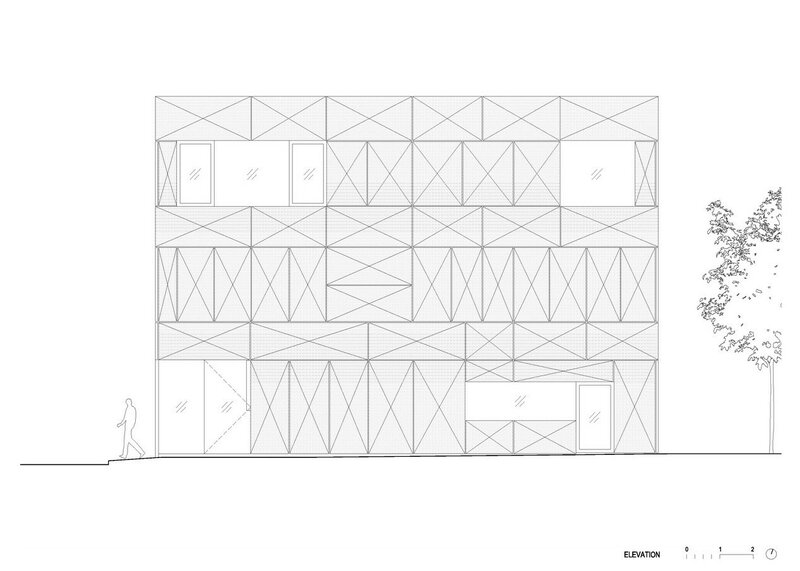 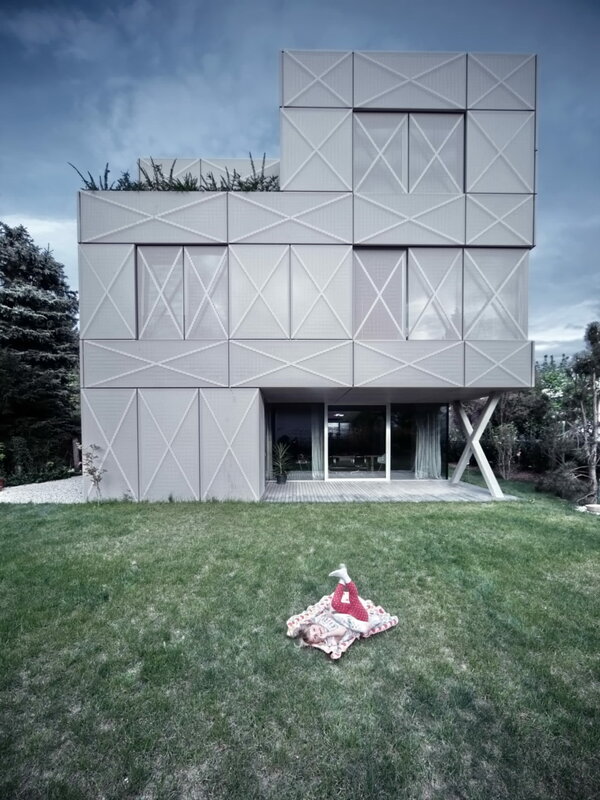 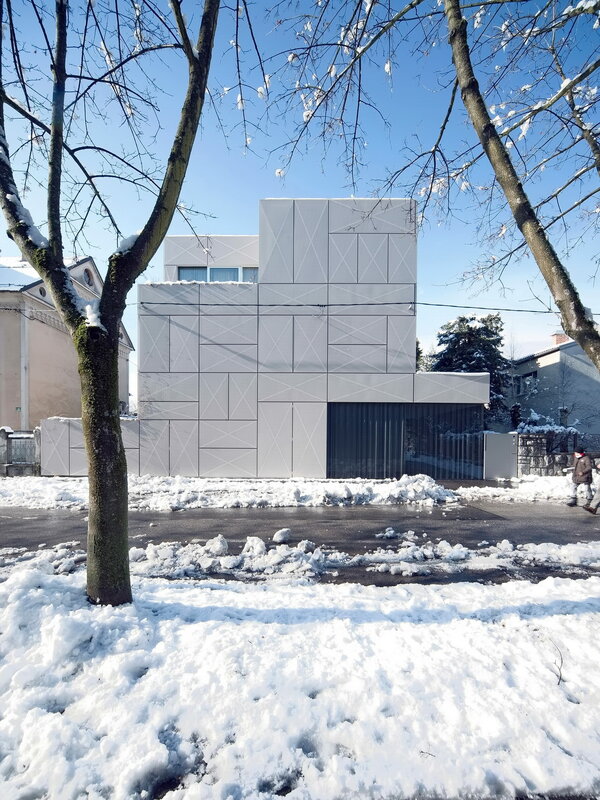 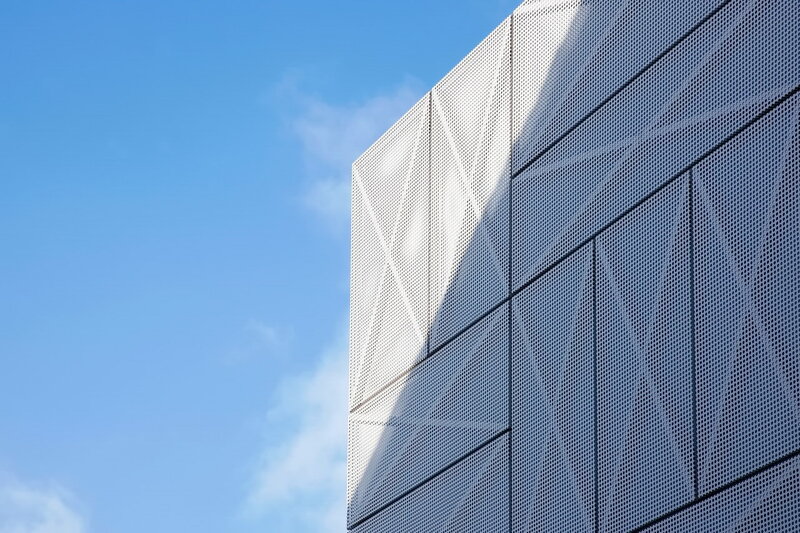 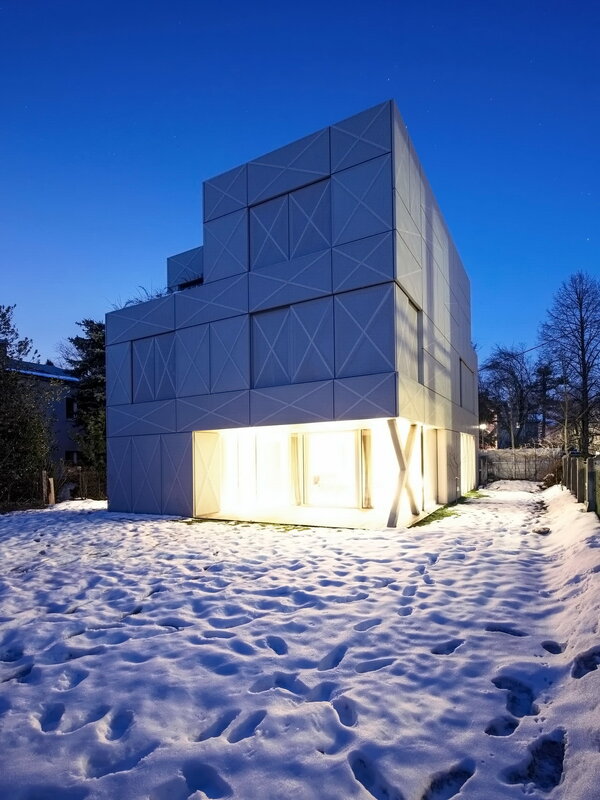 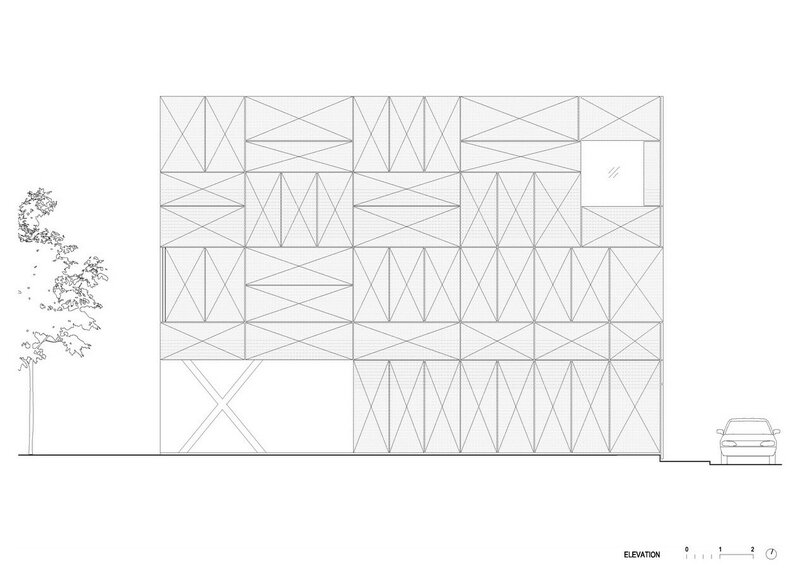 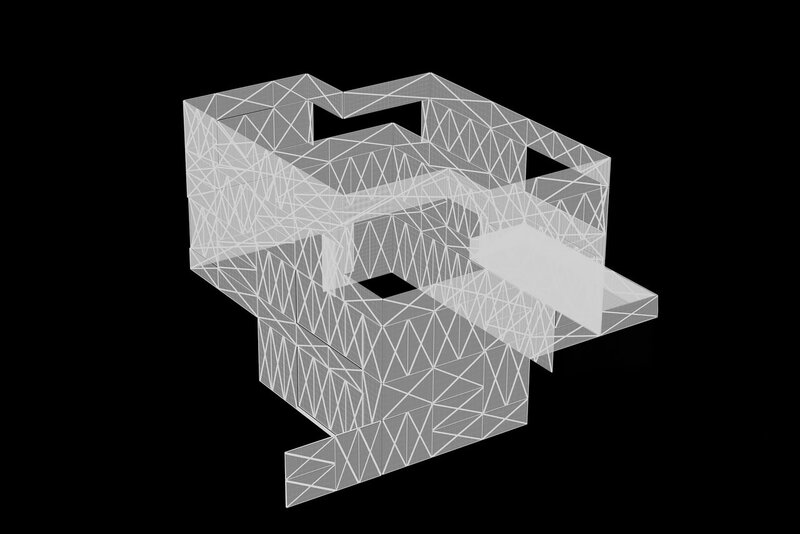 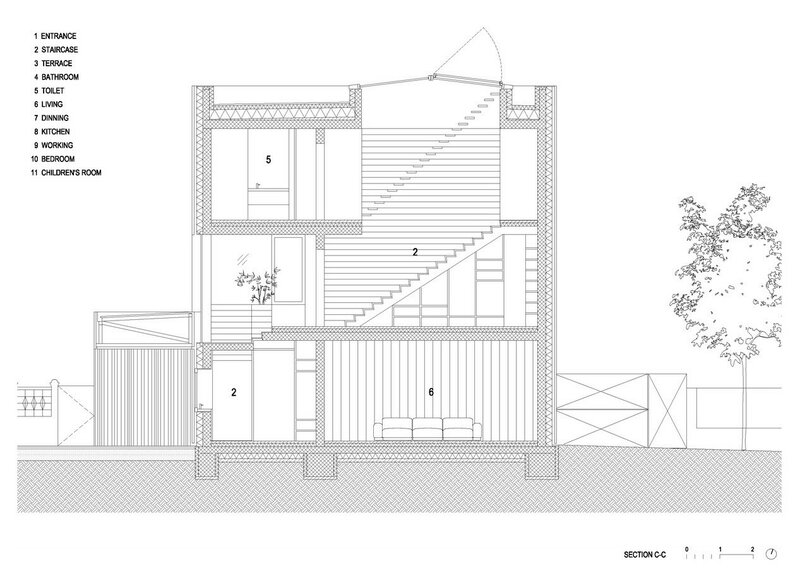 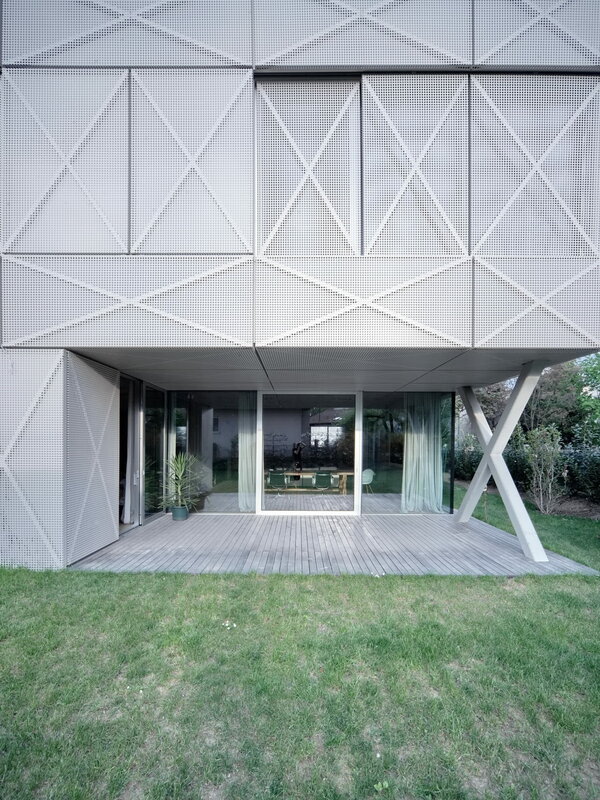 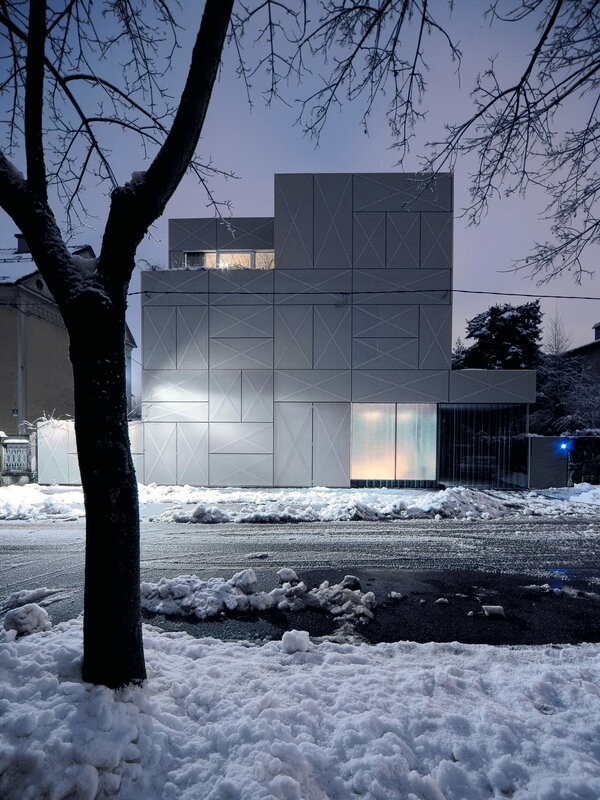 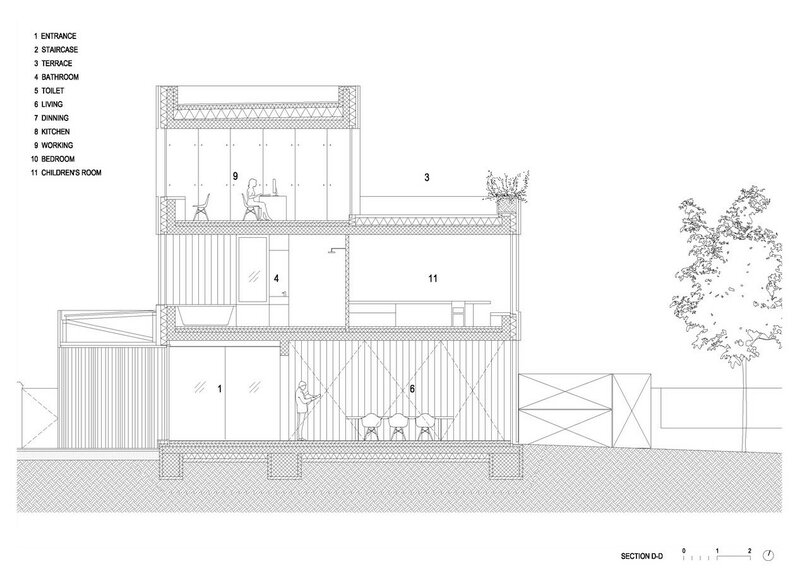 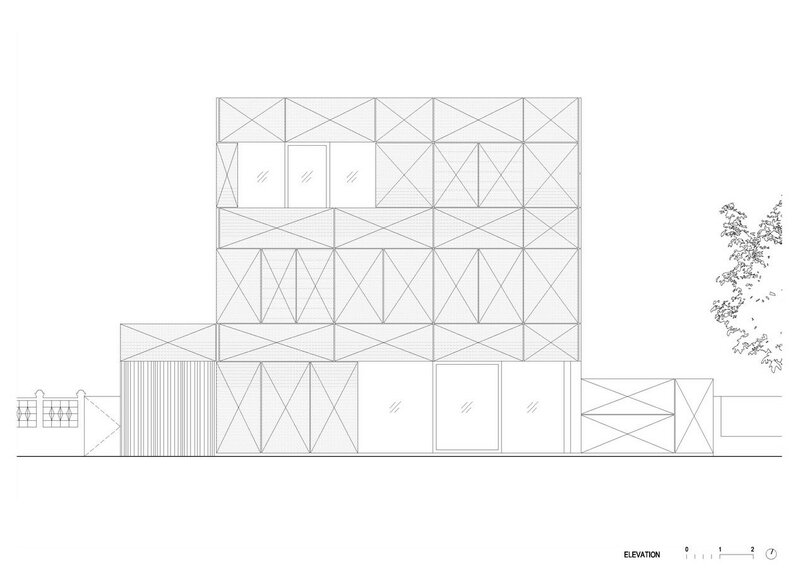 The external structure is composed of a cube volume and perforated metal envelope. 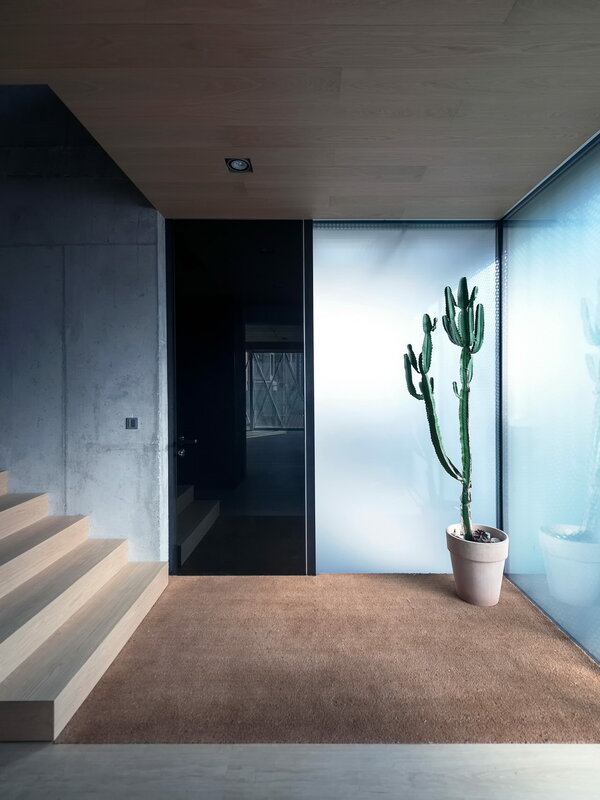 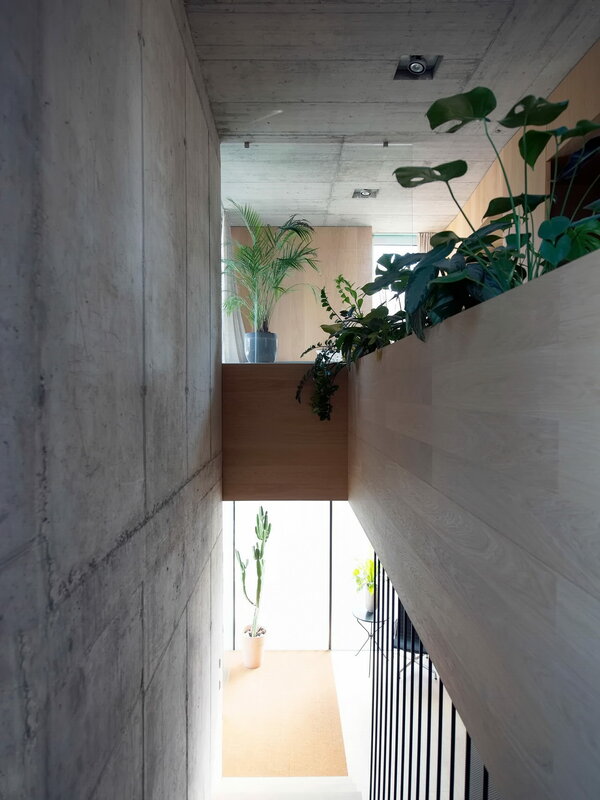 The volume extracts cut-outs to create pockets of space that provide a pyramidical stepping down along the roof, a void along the entrance and private glass patios with terraces for living areas of the house. 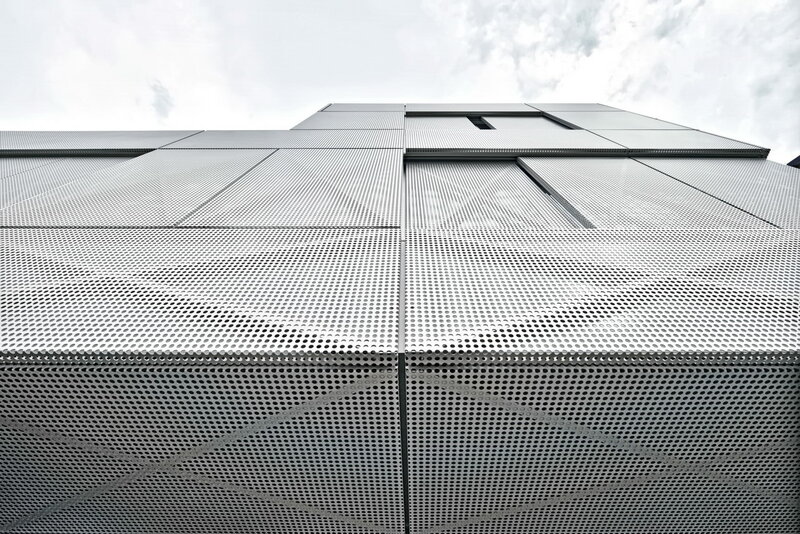 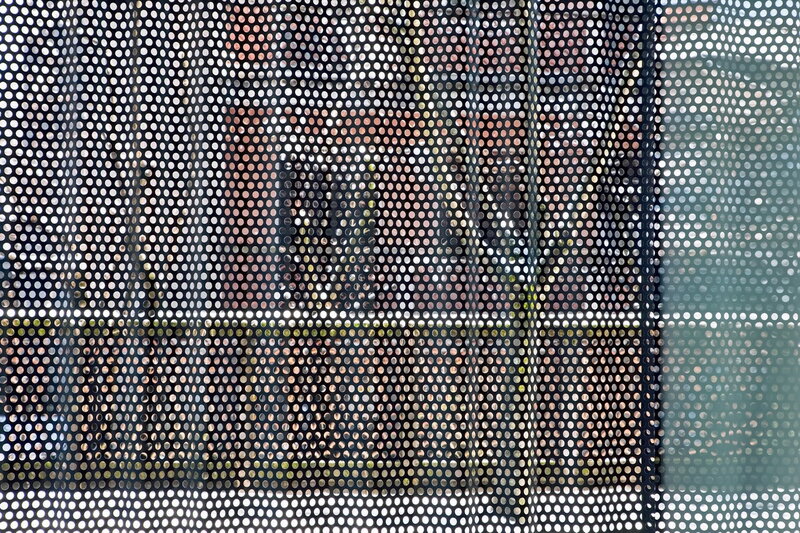 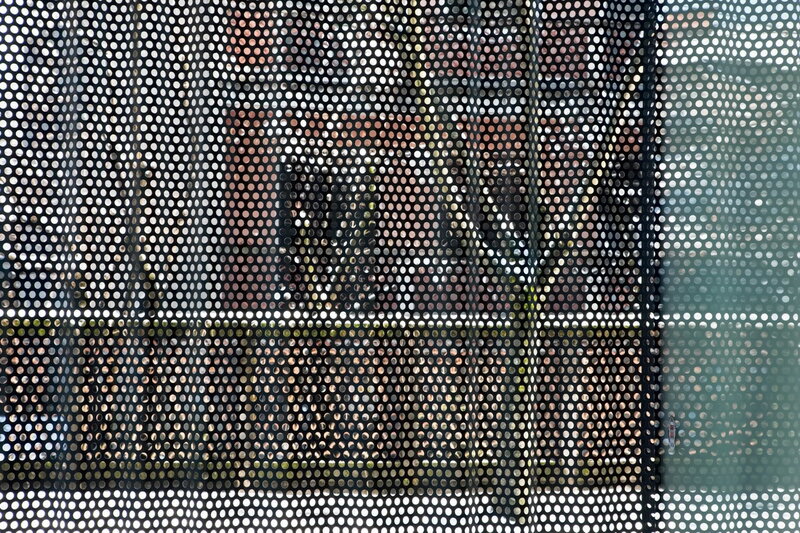 Using a material with holes on both sides aims to make an abstract interpretation of the texture of classical villas in the historical suburb. 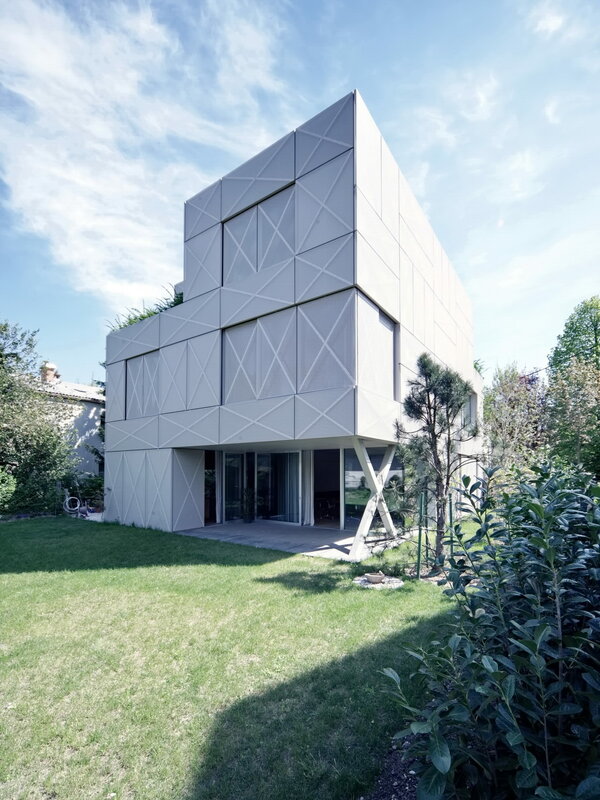 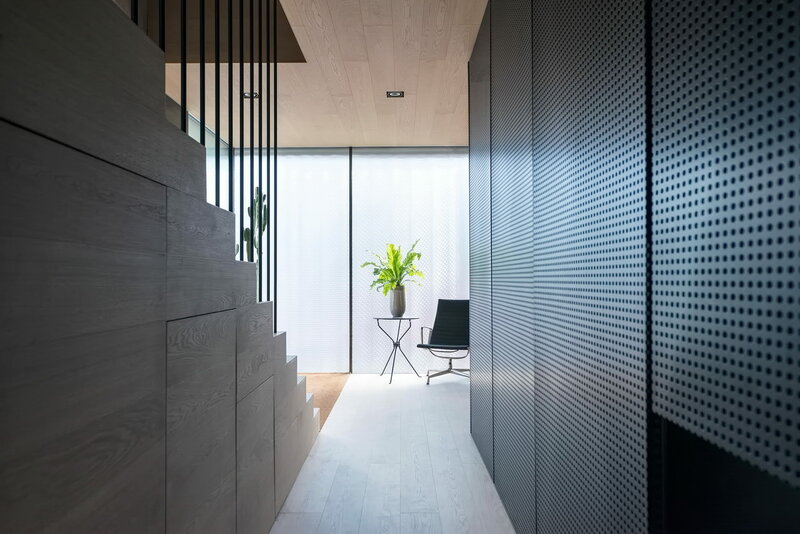 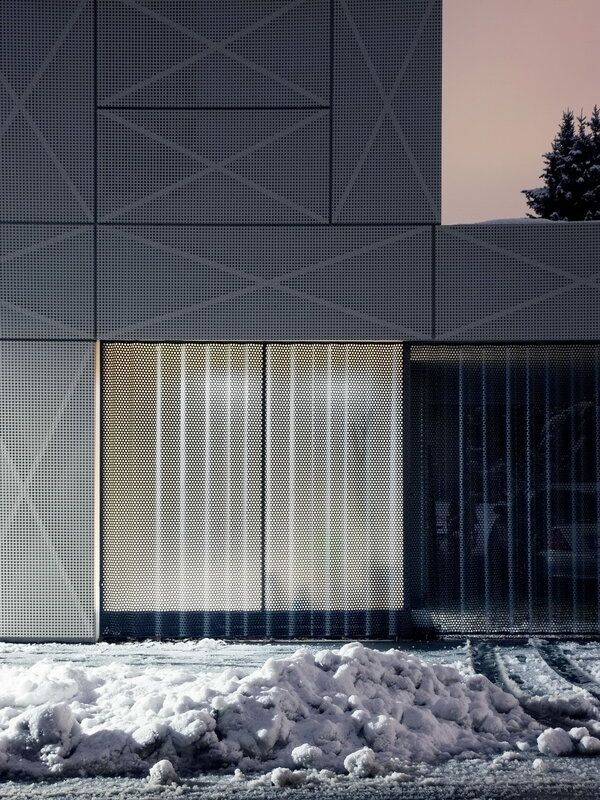 The rough classical façade was represented with double perforated panels; the task was to achieve texture through the illusion of depth which allows a light presence and enhances the shadows and reflections off a palette of beige tints. 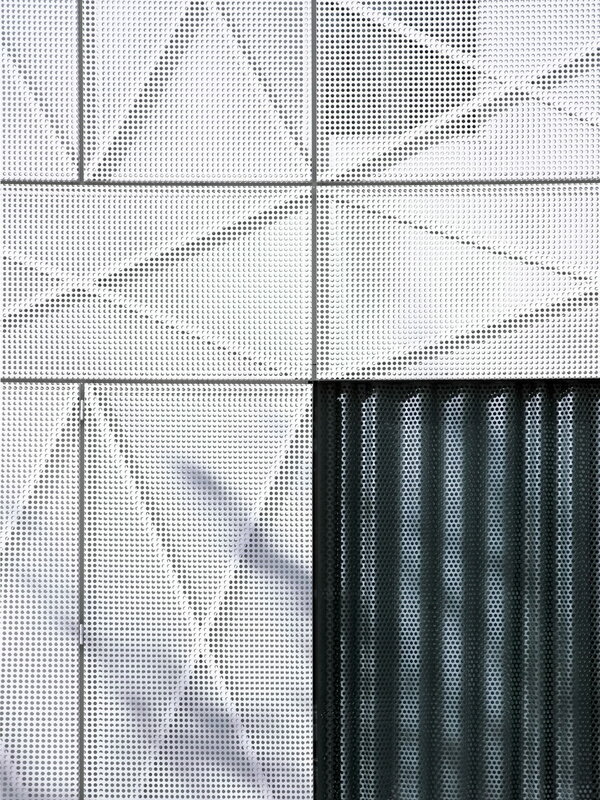 The three-dimensional texture creates a dynamic abstraction while encapsulating its coherent volume. 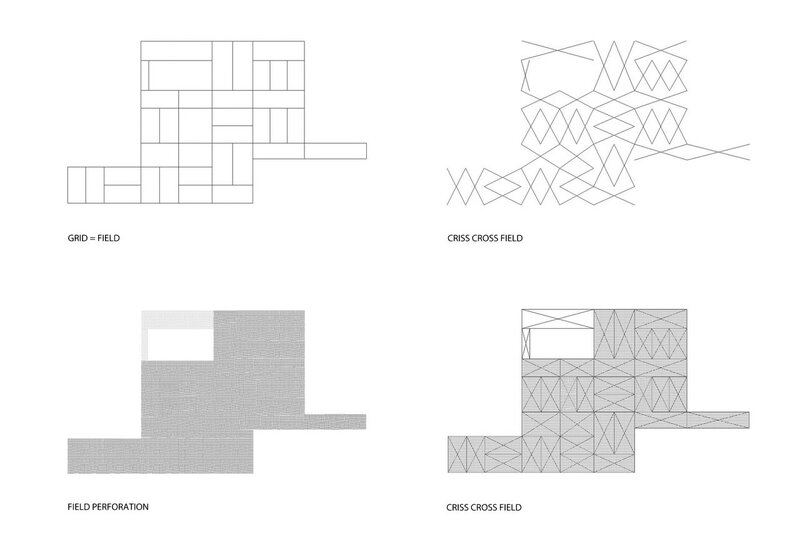 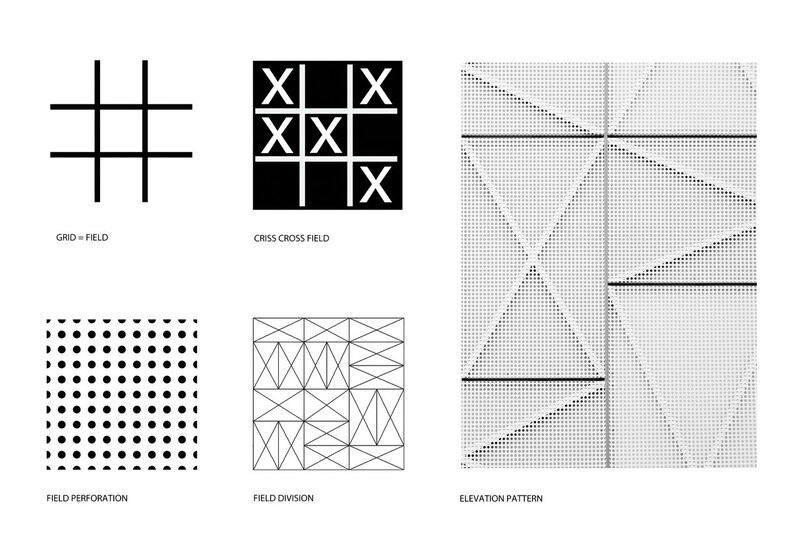 Diagonal crosses act as a functional and graphic representation. 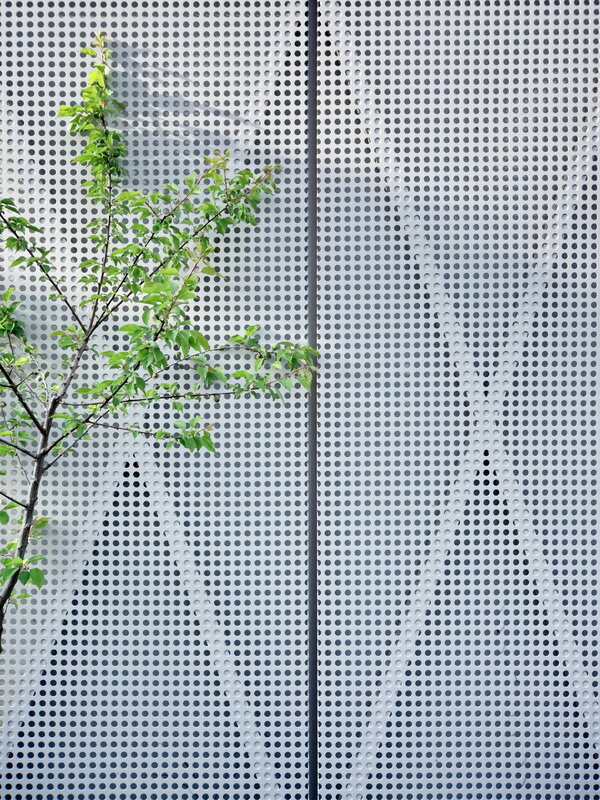 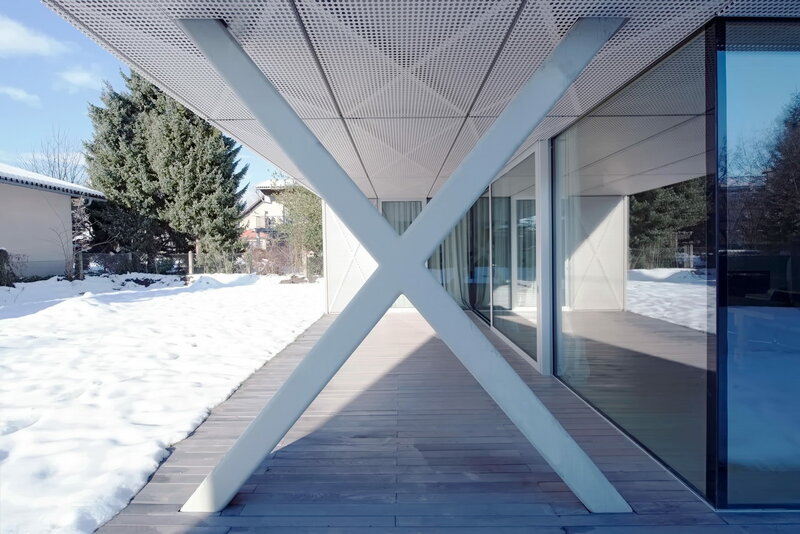 The crosses brace the frames of panels and create identity like façade ornaments on historical citizen villas. 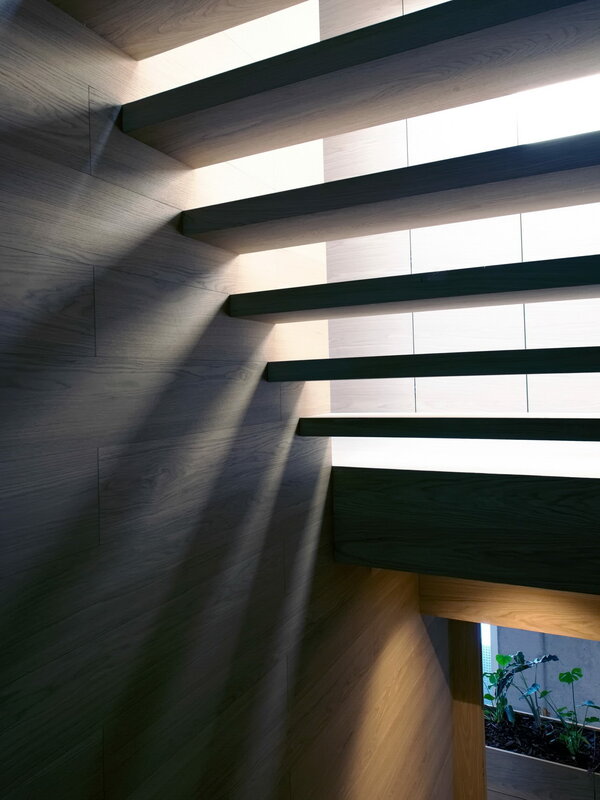 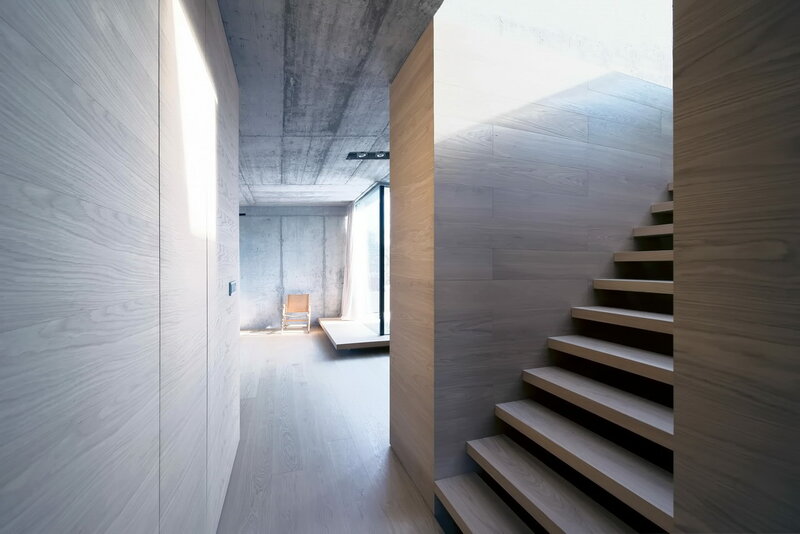 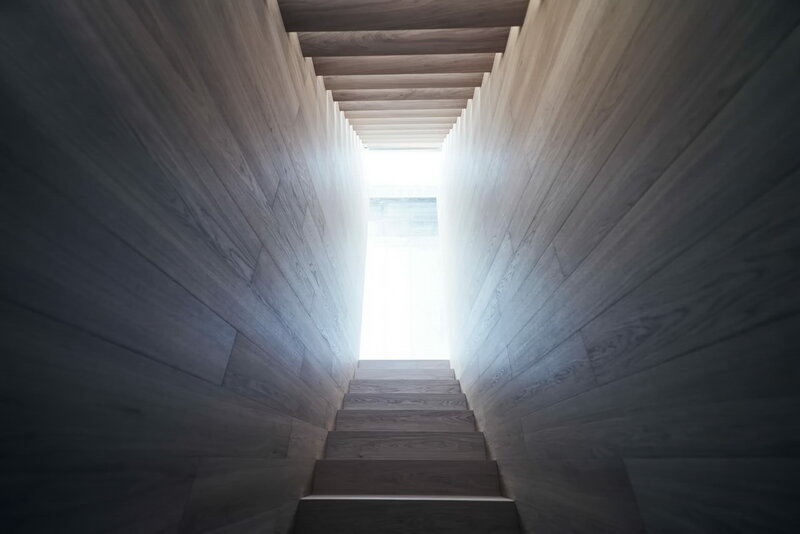 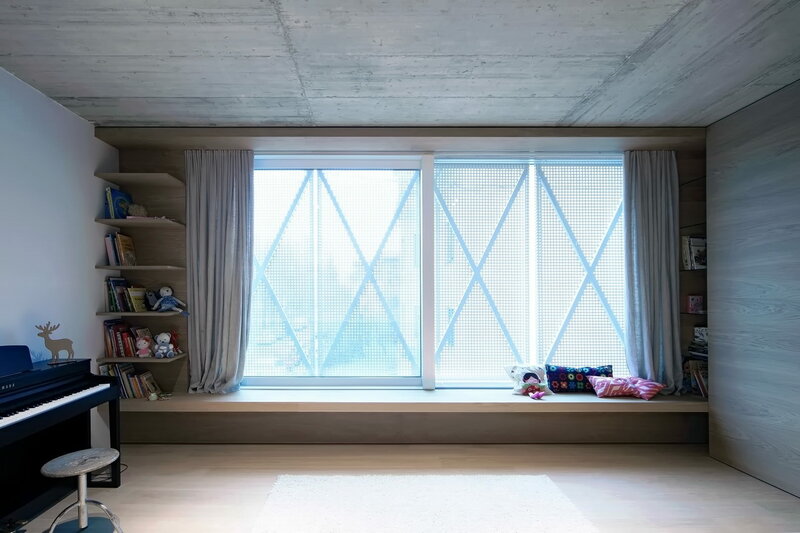 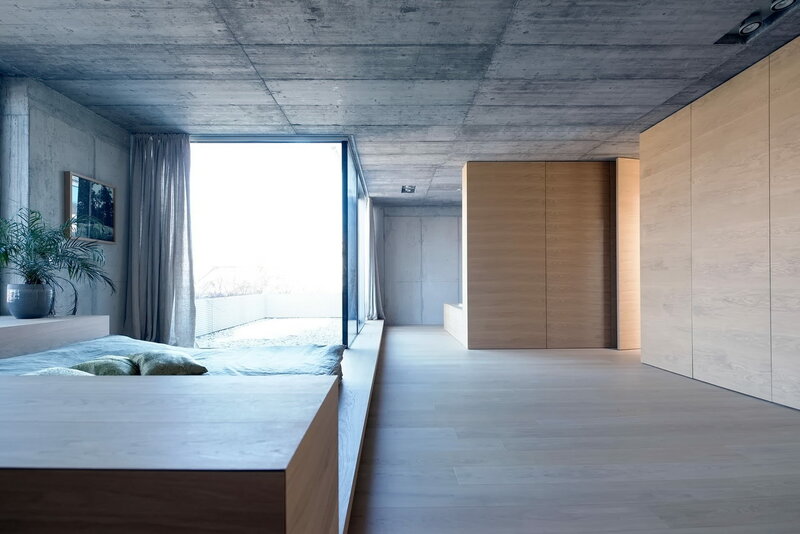 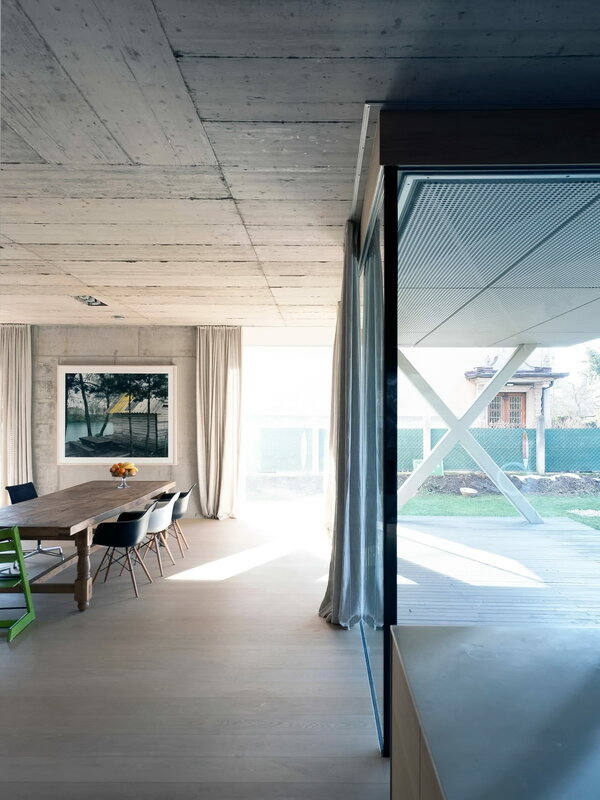 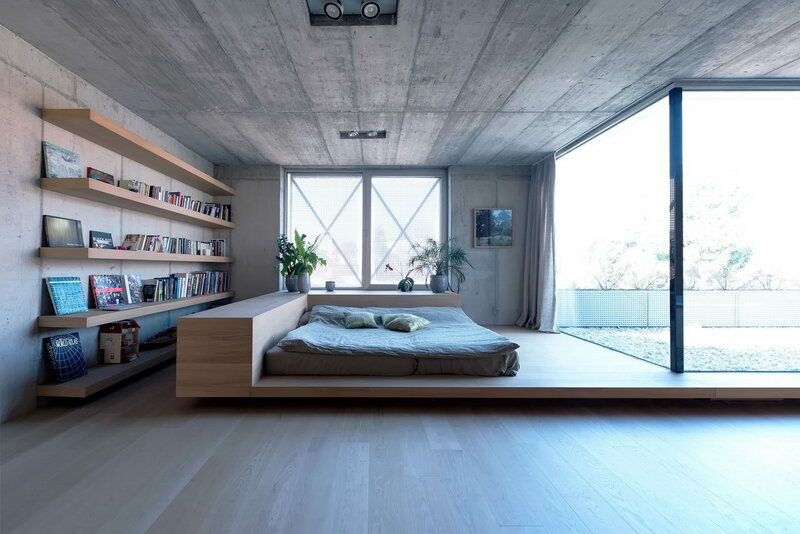 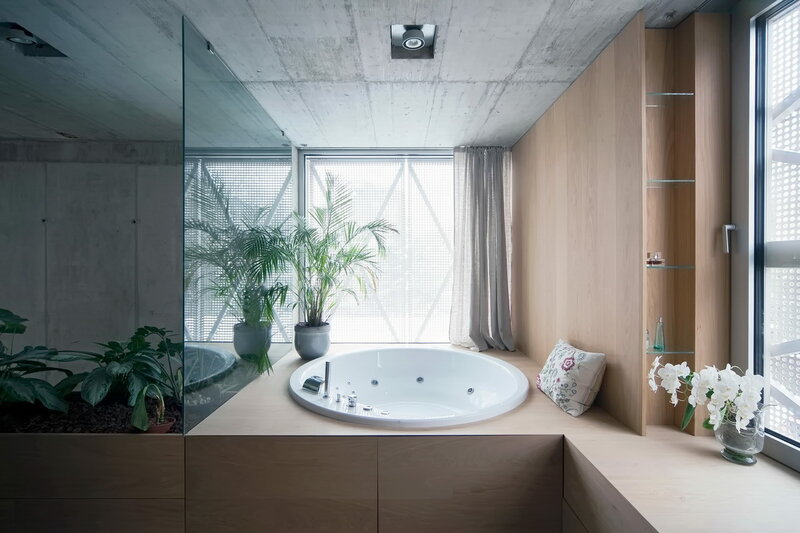 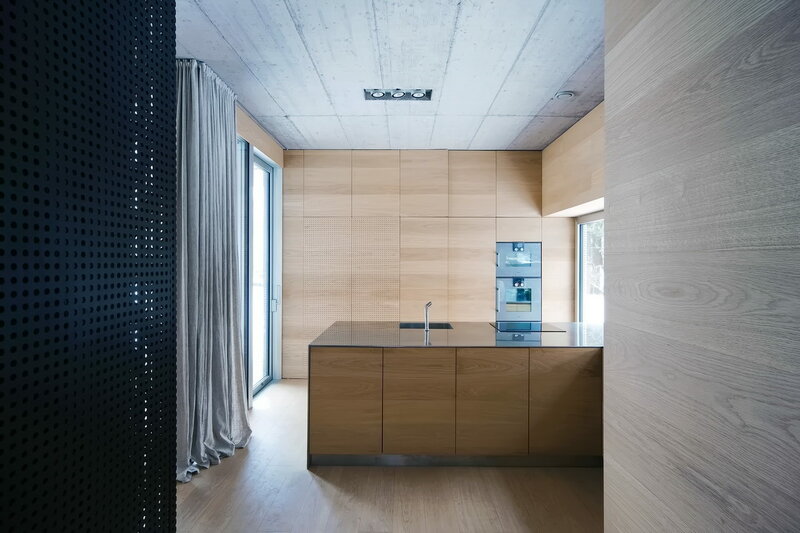 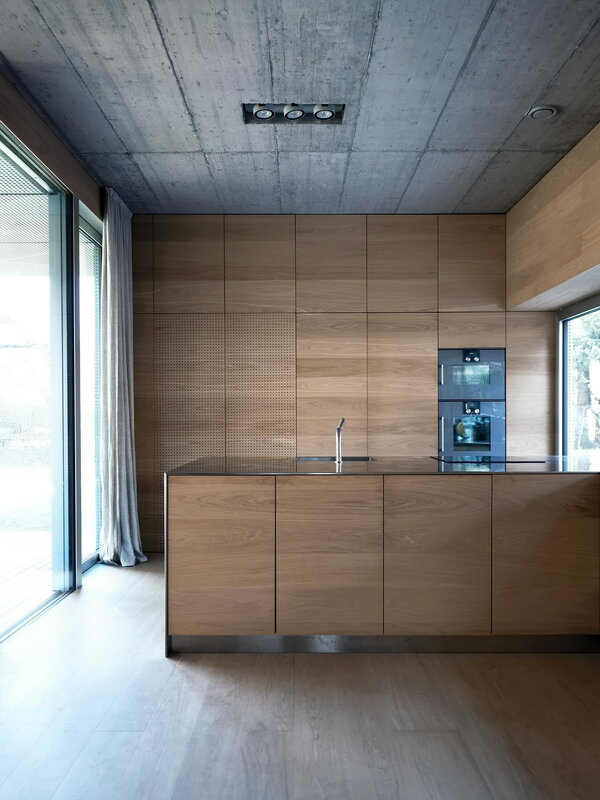 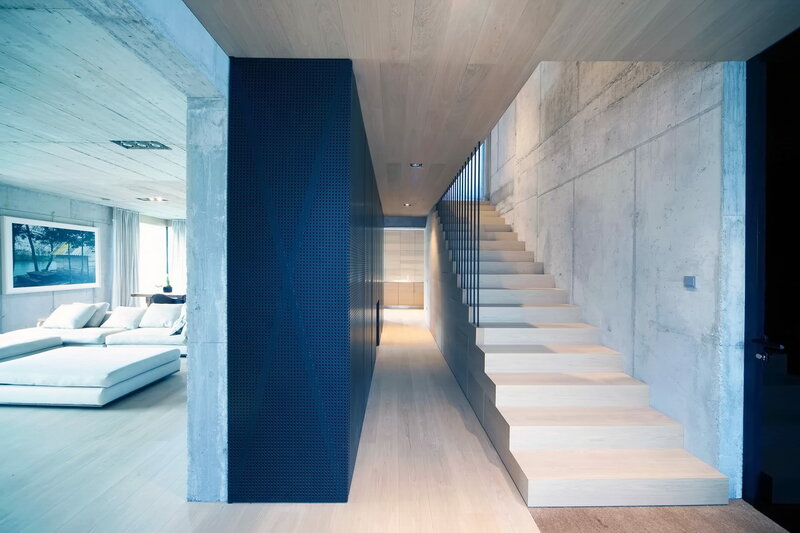 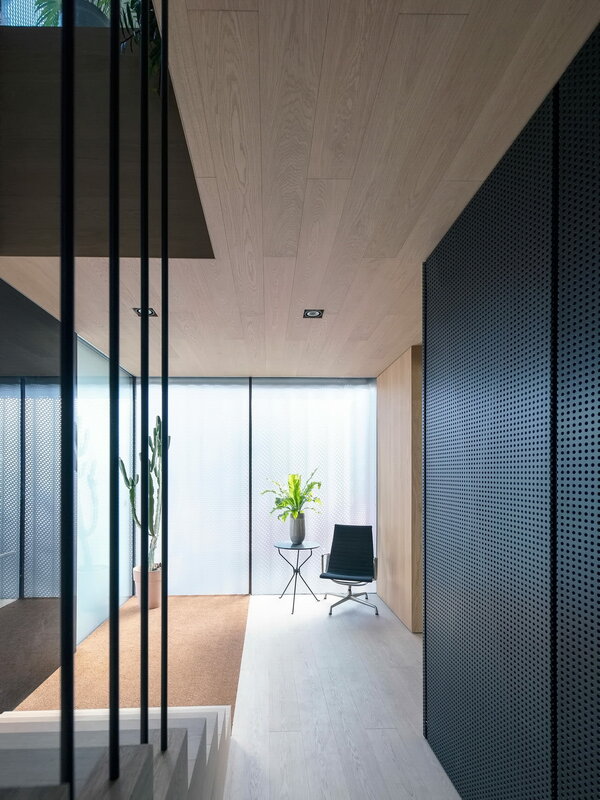 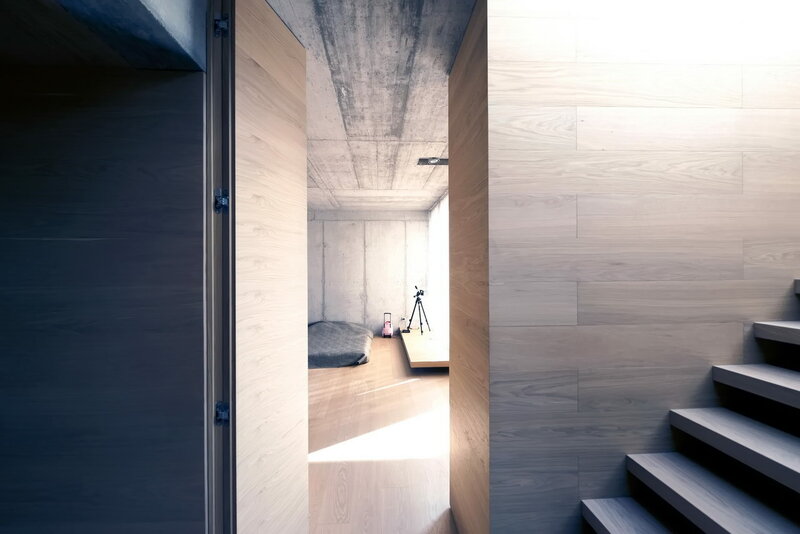 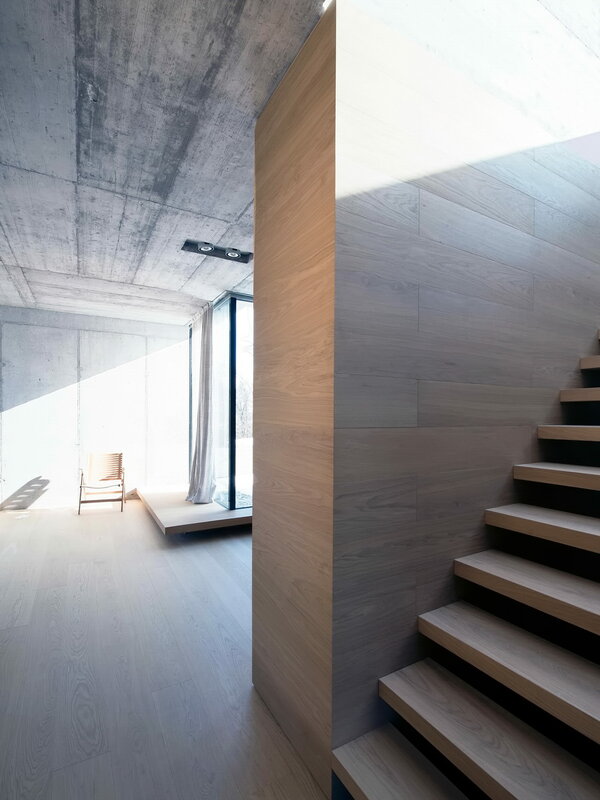 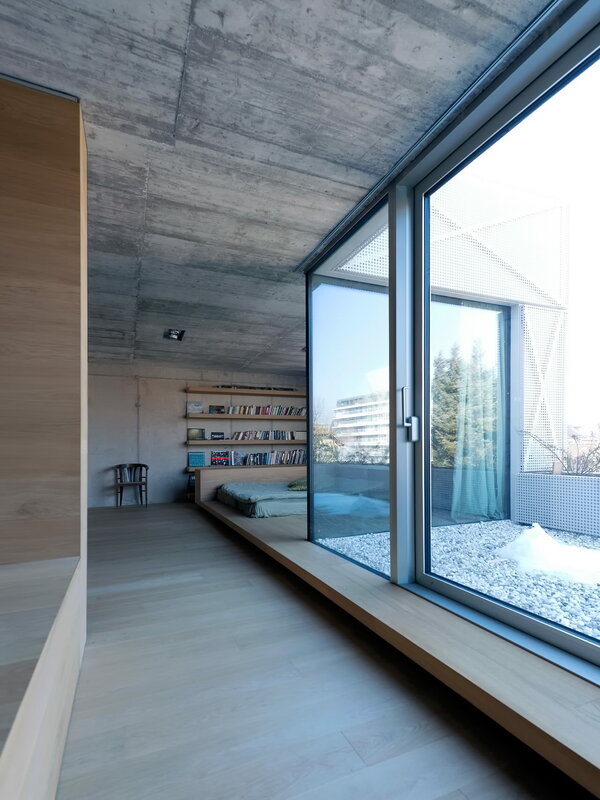 Internal volume embodies two elements: exposed structural concrete walls and a wooden shell. 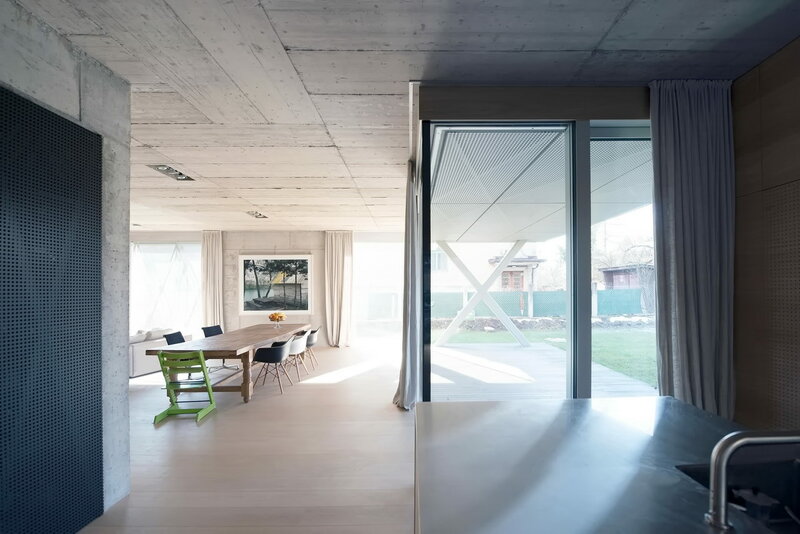 The project required a residence for a single family with three children. 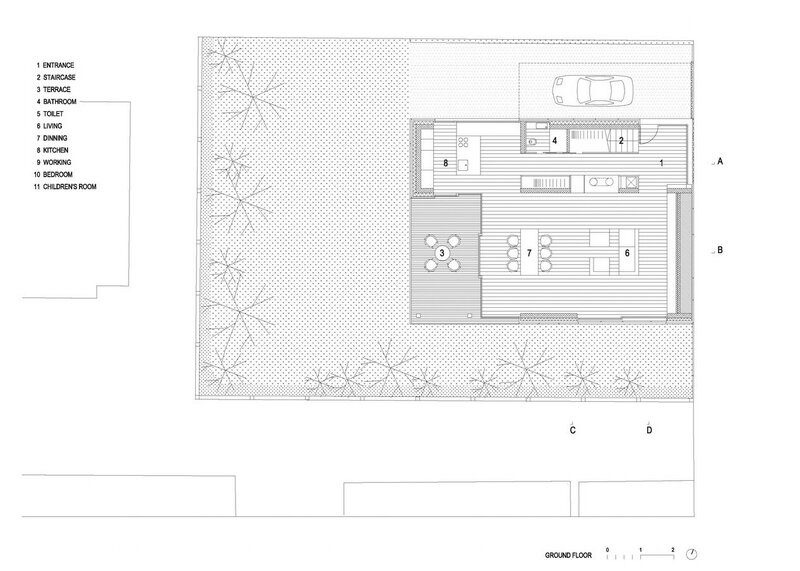 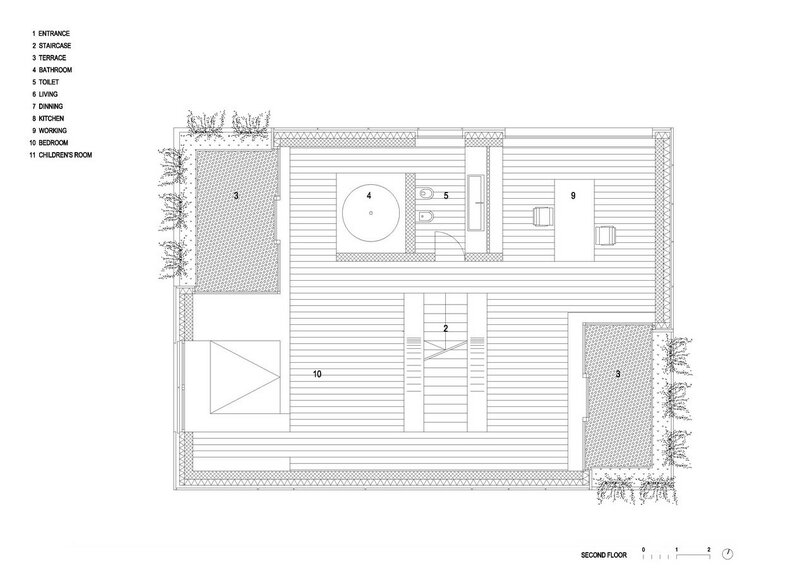 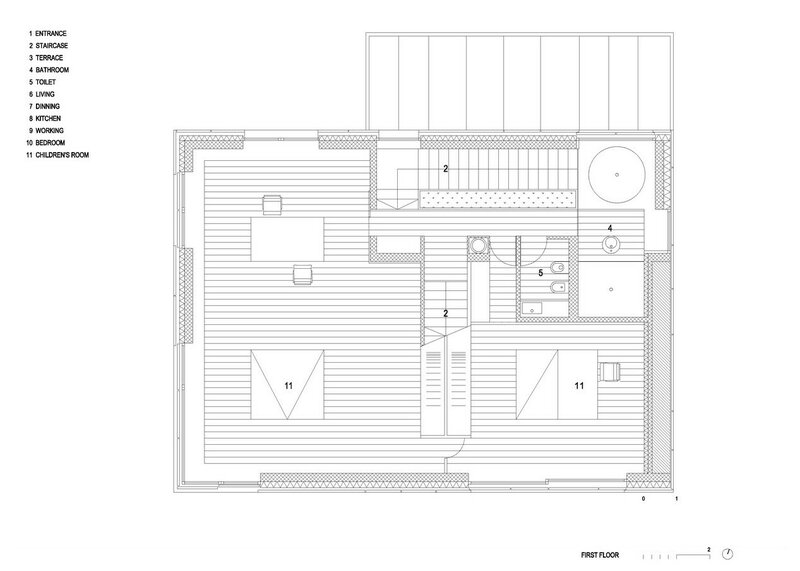 The brief was to maximize living area with minimum of the service space. 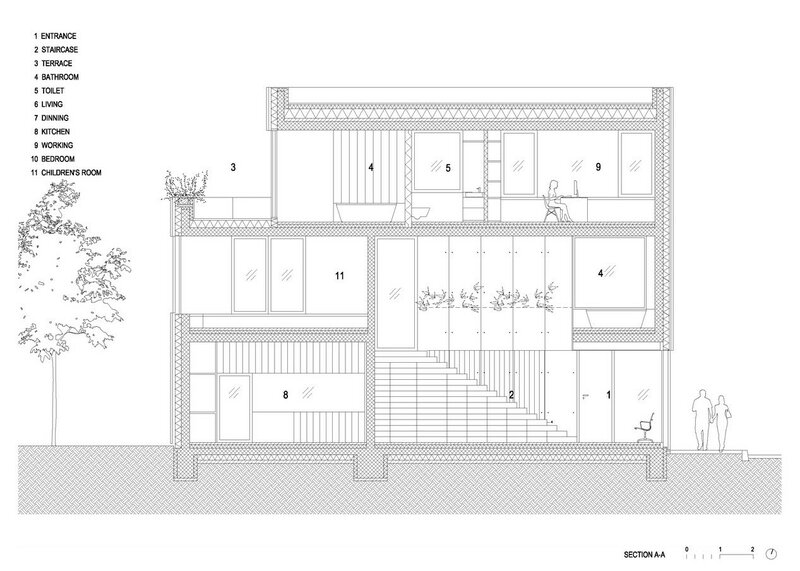 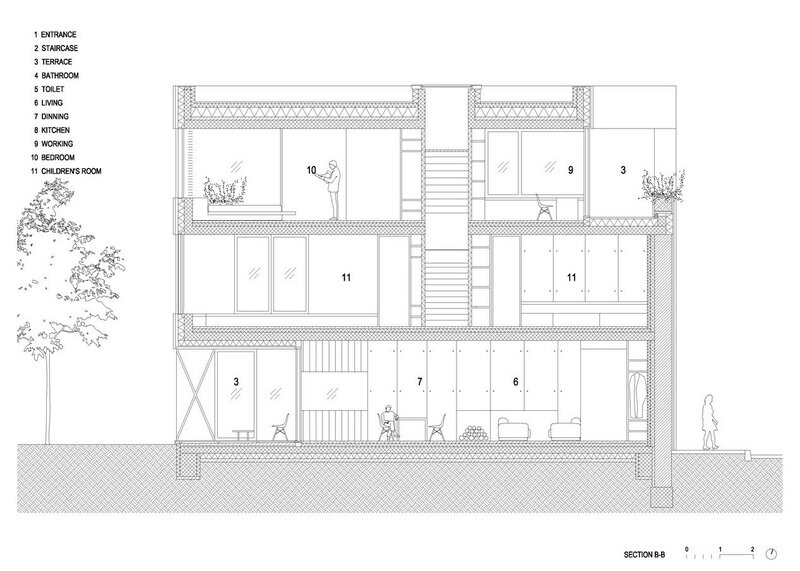 The concept divides space based on distinct program by separating function not by walls but floor levels: ground floor is living/communal space, first floor is children area and second floor parents area. 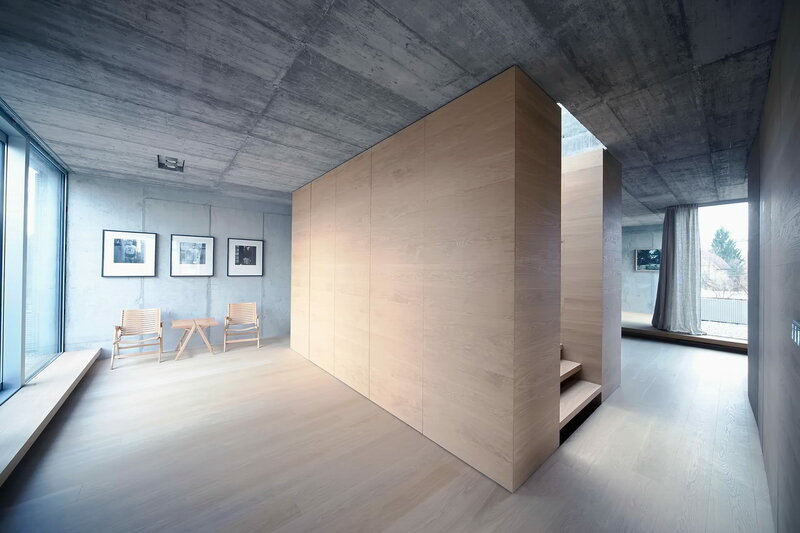 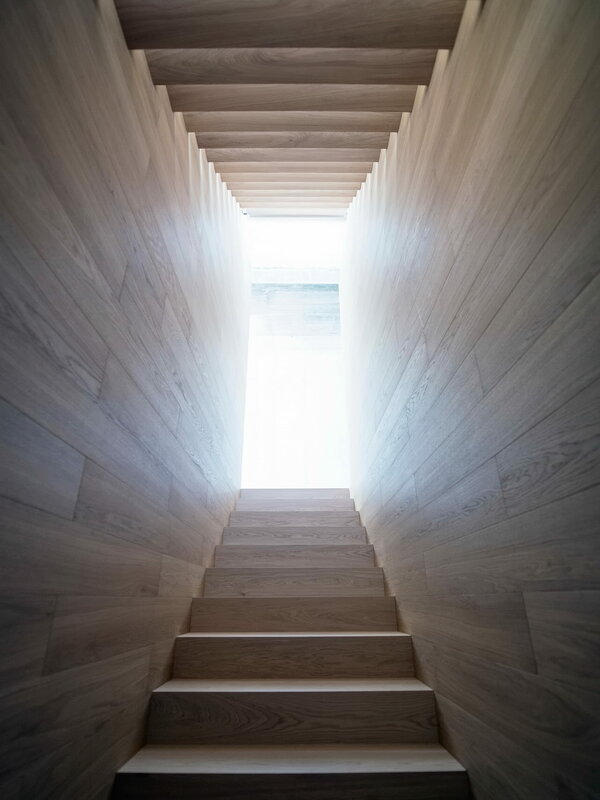 With no cellar, the shell is integral to provide all of the space for storage. 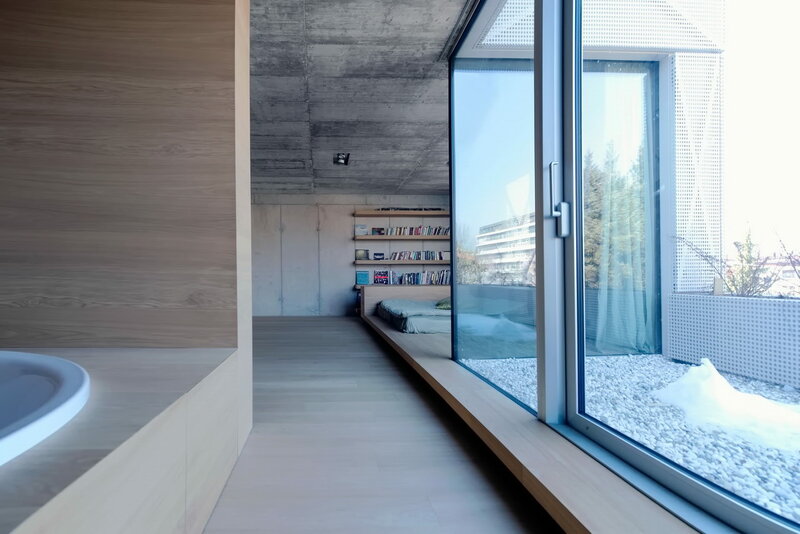 The flush walls fold out to house cupboards, shelves and drawers throughout the living areas and furniture such as beds, seating and counters are built into the floor in order to optimize space and provide easy maintenance. 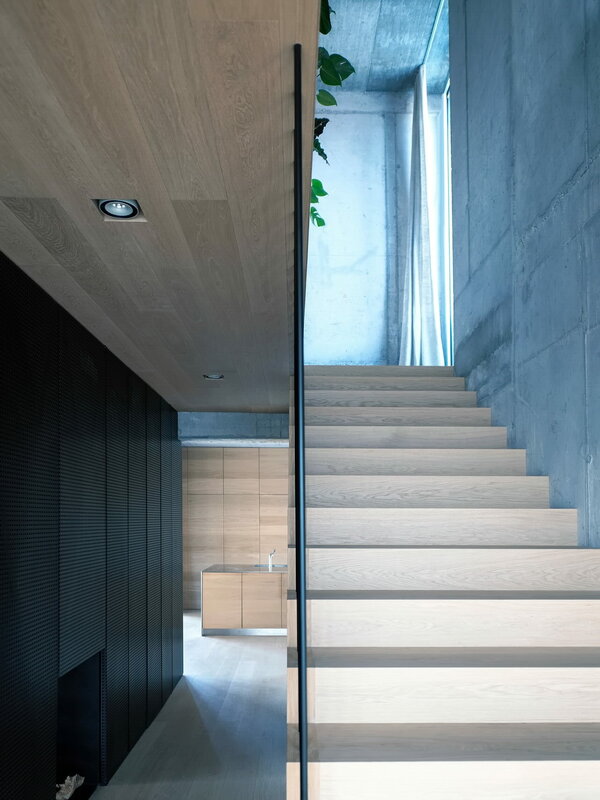 This connects different spaces in the house by giving a common function to partitions.